Shas chairman Aryeh Deri is worth NIS 4.8 million ($1.15 million), according to documents he filed disclosing his personal net worth. The documents were presented on Channel Two News, which has been publicizing the asset declarations made by high-profile politicians running in the March 17 elections. While Deri has made “fighting” for poor Israelis a centerpiece of his campaign - demanding, among other things, a minimum wage of at least NIS 30 for workers in Israel - the Shas leader, who served prison time in the 1990s for corruption, has amassed a handsome fortune for himself. 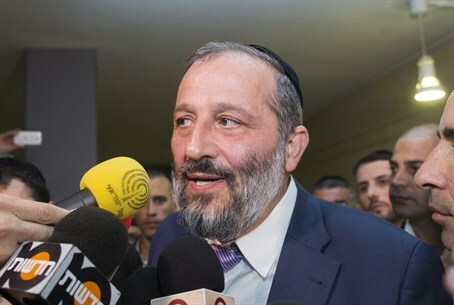 Deri's apartment in the Har Nof neighborhood of Jerusalem is valued at NIS 4.7 million. He purchased it in the 1990s for $200,000. In addition, Deri has a 2011 Skoda Roomster minivan, estimated at NIS 60,000. Deri's checking account has a negative balance of NIS 20,000, but he has a savings account of NIS 10,000. However, he also has a stock portfolio valued at NIS 300,000. Deri owes about a million shekels in personal and business debt. On Wednesday, former Technology and Science Minister, Yaakov Peri (Yesh Atid) revealed that he was worth NIS 9.6 million. In addition, Peri has several bank accounts abroad – one in Switzerland, with a value of NIS 2 million, and one in the US, valued at NIS 370,000. He has NIS 4,600 in his checking account. Earlier this week, it was revealed that Yesh Atid head Yair Lapid is worth approximately NIS 10 million. Lapid, the former finance minister, owns an apartment in the tony Ramat Aviv neighborhood of Tel Aviv that was worth NIS 3.5 million when he bought it in 2004. Today is is estimated to be worth between NIS 6 and 7 million. In addition, Lapid drives a 2011 Nissan Murano four wheel drive vehicle, worth NIS 182,000. Lapid has a modest NIS 4,604 in his checking account, but a much more substantial NIS 2,452,341 in savings, and an additional NIS 1,102,300 in pension money.